Available in e-book format only! FREE on Kindle Unlimited! 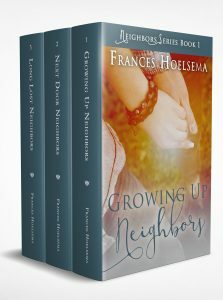 The Neighbors Series boxset includes all three books in the Neighbors Series! This is a great chance to see why falling in love with the boy next door is fun and never goes out of style! A coming of age, young adult love story that showcases a story of two neighbors growing up and becoming more than just friends. This is a clean, believable, love story suitable for all ages. To read more, please visit the Growing Up Neighbors page HERE. A sweet, clean contemporary romance that has a sound message woven right in. There is a lot of pain, passion, and pursuit that ultimately reveals what true love is all about. To read more, please visit the Next Door Neighbors page HERE. This is another sweet, clean contemporary romance that dares to explore the idea of friends (also neighbors) falling apart, but then reconnecting later in life. In this book there is two leading men and one important choice the female lead needs to make. To read more, please visit the Long Lost Neighbors page HERE.